Even though the snow is piling up on the ground right now, I'm thinking about my summer body. I've been kicking my fitness routine into overdrive, hoping to shed these last few pounds before I have to break out the shorts and swimsuits in a few short months. My fitness instructor made a comment to the class this week that really made sense. "You can come to class and bust your butts all week long, but that's only half the battle. If you aren't seeing an improvement after all that moving, maybe you need to reevaluate your meal plan." She hit my problematic nail right on the head. To say I have a sweet tooth is an understatement. I always have the urge to eat something sweet after dinner, which pretty much kills all the work I just put in, since I usually want a cookie or chocolates. I am slowly making better after dinner snack choices though, reaching for Greek yogurt or a fruit ice pop, but I think it's also a good idea to have ready-made fruit cups on hand for more variety. 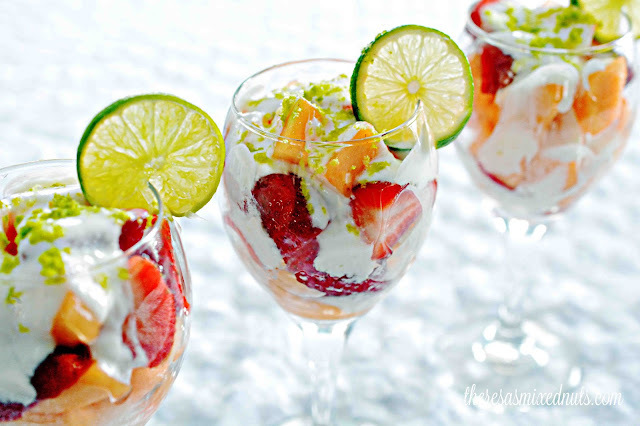 This Fruit Cup with Lime Yogurt Sauce is a great option, combining delicious fruit and yogurt into a sweet-tooth approved dessert. This recipe calls for strawberries and cantaloupe, but you could mix in any number of fruits to customize it to your own taste. I'll throw in a few blueberries and blackberries into the mix the next time I make this. Grate some lime zest over the top for more pop of color and pretty presentation. That's terrible! Limes are really abundant and inexpensive here. I can get 5 for $1. Lemons are a bit pricier, though at almost $1 each for the bigger sized ones. You can get a small bag of them for about $3 for the smaller sized lemons, but they don't give off a lot of juice and don't look very pretty (only a gripe because of food photography). Mine too, Rosey! Jason has finally jumped on the fruit and yogurt snacking too. I am seriously contemplating buying a yogurt maker with how much we go through here. That sounds awesome. I love stuff like this for breakfast. Nom. Meals sure are just as big as the work out, both have to work in conjunction. This looks good. I love any fruit, so I'm gobble it up! This looks so yummy. It will make a great healthy snack or dessert. Outstanding! I love the look of these, and I love that it's a tasty treat that's also healthy. This looks like such a tasty treat. 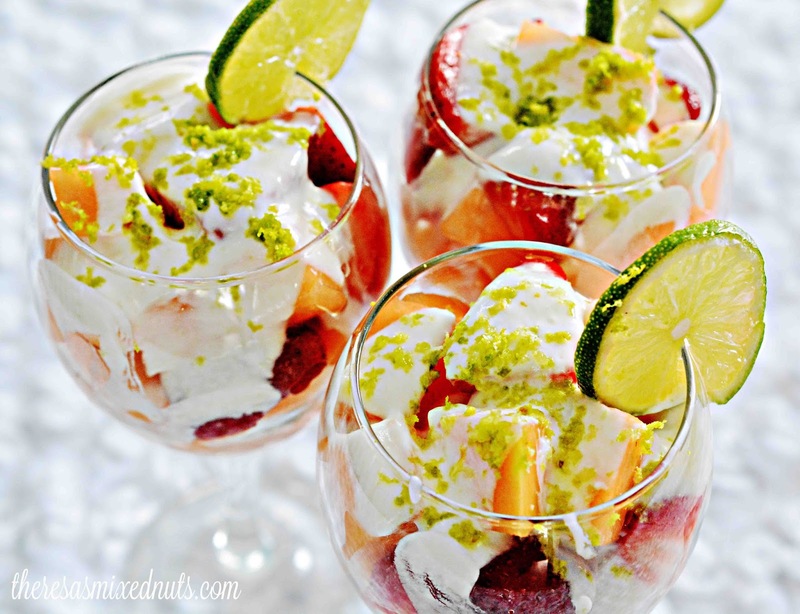 I love fruity desserts or snacks like this one. This dessert idea is genius and great for those of us who are watching our calorie intake. These flavors make me yearn for summer too! Oh my word, this reminds me of a fruit and yogurt dip I had at a resort years ago poolside! It was so amazing I had to order another one, yummmm! Honey in yogurt is so delicious, you're making me hungry. This looks fresh and satisfying. Pretty too. I hear you on the sweet tooth front. This is a great idea. I am excited to try making this. It looks so delicious and easy to make. I am sure my kids will love them. Honey is so good for you, too! I try to eat at least 2 TSP of honey a day. I can't wait to try this recipe, it sounds simply delicious! Diet is such an important part of the fitness routine. I am also like you in that I crave desserts (cookies hit the nail on the head) big time! Oh wow. That ilooks like a great recipe. I think that this would make a great dessert when we have company next week! Pretty Parfaits! I love these and looks so delish gotta add that honey! This looks really yummy! Who says food can't be healthy and tasty all at the same time? !